FILE - Cambodia's Prime Minister Hun Sen looks at his smartphone at a ceremony in Phnom Penh, Feb. 25, 2016. The killing of independent analyst Kem Ley and a broad crackdown on dissent in Cambodia has hardened attitudes against Prime Minister Hun Sen among the Khmer diaspora living in Australia and the United States. However, prominent members of the communities warn disillusionment with the long-ruling Cambodian People's Party (CPP) would not automatically result in further support for opposition leader Sam Rainsy, currently living in self-imposed exile in France. In Australia, Hong Lim, a prominent member of the Victoria state parliament and the Khmer expatriate community, has dropped his support for Sam Rainsy, head of the Cambodian National Rescue Party (CNRP). He said the opposition leader's performance, after losing four consecutive elections, and a lack of consultation with the diaspora in Australia had cost him. The Australian diaspora has historically provided lucrative support for the opposition, which was forged into the CNRP ahead of elections in 2013, through a merger of the Sam Rainsy Party and the Human Rights Party, run by Kem Sokha, who is currently the opposition’s deputy leader. FILE - Cambodia National Rescue Party's Kem Sokha, pictured in Phnom Penh in February 2016. Sam Rainsy refused to return to Cambodia earlier this year after he was threatened with jail from a defamation suit. Kem Sokha is also facing possible jail time over a similar issue and Hong Lim added the CNRP had failed to promote young talent from within it its own ranks. “There has never been a succession plan,” he said. Adding new leaders, he said, was a major problem confronting the CNRP ahead of commune elections next year and general elections in July, 2018. A further 18 CNRP members and supporters have been jailed while the public shooting of Kem Ley, a popular radio host and political analyst, had flabbergasted and angered the Khmer diaspora, Hong Lim said. The government here in Phnom Penh has become increasingly wary of the diaspora, formed by hundreds of thousands of Cambodians who fled decades of war and found homes as refugees in the West. Interests groups among the diaspora have also been accused of fueling opposition discontent – often descending into violent anti-government rallies – and that includes unfounded allegations of land grabbing by the neighboring Vietnamese. Hong Lim has also been sharply criticized by the Cambodian government and declared persona non grata after he labeled the CPP-government a “beast” in regards to Kem Ley's death. Cambodia mourners take photos as they watch the funeral procession for Cambodian leading government critic Kem Ley, whose portraits are displayed on a vehicle, in Phnom Penh, July 24, 2016. In the U.S., Kem Ley’s murder has also sparked anger among many Cambodian Americans. But concerns are also growing about the ability of the opposition to compete in the current political landscape. Sok Paul Pen, President of Youth and Students Relations for the CNRP in Lowell, Massachusetts indicated campaign finances were emerging as a major issue for the opposition ahead of elections. "We will travel to Cambodia in 2017 and 2018 to encourage young people within our network and beyond to focus on the election and observe the election process, helping out with transportation, and also appeal to them to provide some financial support in preparation of the elections,” he said. 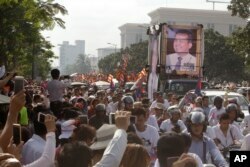 His sentiments were echoed by Tung Yap, President of the Cambodian American for Human Rights and Democracy, which he said was focused on providing an equal playing field for all political parties in terms of media coverage. “As the matter of fact, reports or coverages such as the land grabbing issue in the country where people across the world are aware of is unheard on the state-controlled television and radio,” he said. However, Vibol Touch, President of the Cambodian-American Alliance, sounded a more conciliatory note by stressing his organization was in the process of organizing a public forum to enhance diplomatic relations between both countries. 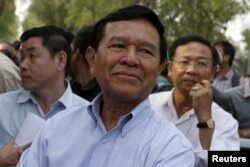 Hun Sen recently singled out the American diaspora as a potential base of future support. Ten Soksreinith contributed to this report from Washington.